It was almost too simple: I cut the bottom portion off my potato (meaning the portion that didn’t have as many sprouts), suspended it using toothpicks over a jar filled with water, then sat it in a sunny location. And, voila, in a few weeks, according to what I read, I should have the beginning of sweet potato vines. A sweet potato extended over a jar of water is sharing a windowsill with African violets. My internet research also confirmed what I had always suspected: sweet potato vine is related to Morning glory (they have look-alike leaves). What I didn’t know was that in some climates it produces a flower similar to Morning glory. Alas, not in Zone five. Since I’ve already purchased my two sweet potato vines for the season, the fate of my container garden doesn’t hinge on the success of this project. But it’s great for a day’s diversion. The flowers that I saw pictures of online were white with purple centers, but I’m not sure if that is the only color possibility. [Hopefully, someone will comment and tell us.] They don’t flower here, but I think in your climate they should. Maybe this is one you could try for your flowering plants. Take care! My mother often used to have a sweet potato vine growing in a vase that looked like a large brandy snifter. As a matter of fact, when I was a kid, that’s what I used to think sweet potatoes were for — not for eating! They are very pretty as a houseplant. Plus, you can start them early and pop them in your containers. Sweet growing. That is super – I always wondered too. I like to put one or two in my pots for a different color. I’ve had them a few times over the years but never knew they bloomed until last year. Maybe I’d better buy a couple sweet potatoes and try the experiment. Great information. I swear I learn everyday blogging. Oh and I did the avocado once and it worked too but I didn’t keep it growing I don’t think – it was so long ago. I’ve only ever had the ornamental sweet potato vine flower for me. I remember doing that avocado trick. too ~ it actually worked for us ~ maybe we got lucky? I just learned last year (on another blog) that the potato vines flowered. I haven’t ever seen it myself tho (and I’m in zone 5 too). In February (I think) I pulled some potatoes out of my brugmansia pot (that I was overwintering in the basement). Now I wish I’d kept them so I didn’t have to purchase them this summer. They are a staple for me too. I like every variation. We are always trying to find new things to grow and this may be our next project. I’ll have to do a bit of research to see if they’ll grow over here. Thanks for the inspiration. We tried to grow sweet potatoes here two years ago in large pots. Starters were purchased frin a garden store online which were basically just a couple leaves. The plants did pretty well in our greenhouse (we’re in Germany so it wouldn’t have been quiet warm enough for them otherwise) and had some nice growth but never any flowers and they didn’t seem to produce anything either. But to be honest, we kinda lost interest in our garden somewhere along the line that year. I nearly killed everything with ammonia (trying to banish slugs but getting a mixture WAY too strong from the internet for what I was wanting to do) and things just sorta went downhill from there. I can’t recall us thinking, “oh man, we had huge potatoes in here” when we dumped the pots, though, so I’m not really sure they did well with us at all. Absolutely beautiful plants though. The vines that you grow from the potatoes don’t require the same heat it takes to grow the potatoes themselves. I’m attempting to grow it inside on a windowsill in Chicago, so you could surely do the same in the UK. Cheers! My attempt at growing sweet potatoes this year has sadly failed. I purchased some slips (cuttings) from an online nursery, but they sat in the post office for several days before I could pick them up and the contents were looking a bit limp. Still, I duly potted them up, but they failed to take root. Better luck next year I guess. I’ve never attempted to grow sweet potatoes. Might put that on my list of things to grow next year. So you can just grow them yourself? Crazy. I noticed that I pulled up potatoes at the end of the season, but I just tossed them, assuming they were different. I wonder if the ornamental vines produce edible potatoes? 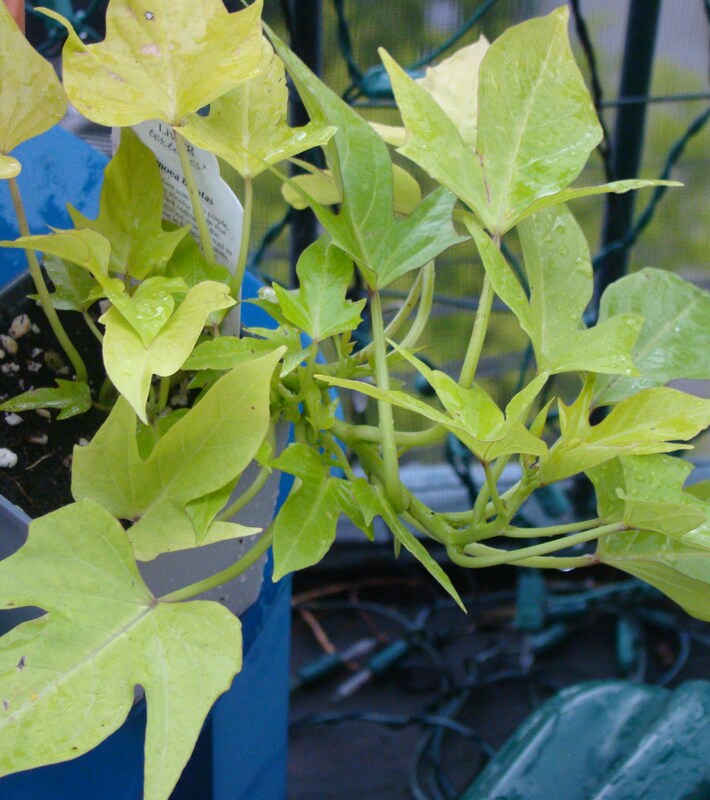 I’m going to have to try growing my own, since I have such sporadic luck getting my sweet potato vines to grow well. I had one good year, but most years they just sit there. If I could grow my own, I could try out different timing and locations and figure out what the secret is. What zone are you in? My sweet potato vines always do well, although one year I planted a purple one that didn’t get as long as the green one. 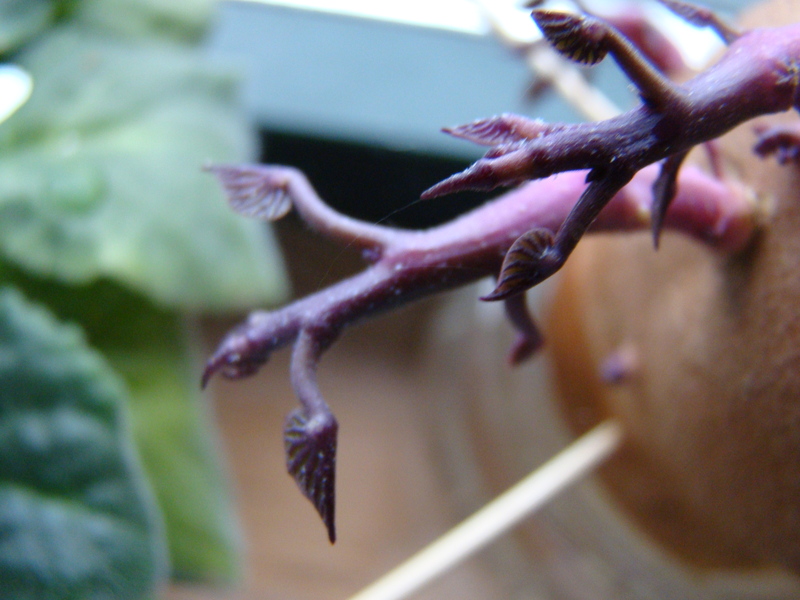 I never noticed a potato sprouting from my vines, but it kinda makes sense that it would work in reverse. And now that you mention it, when I cleared my pots a few weeks back there was something a little mushy in a couple pots that I couldn’t identify… hmmm. Maybe other readers can weigh in and enlighten us. Thanks for making us think! Now that’s a project for ya!! so how’s it progressing? It’s too soon to say much about the sweet potato, but the leaves do look like they may be a bit bigger. I’ll write a post later when there’s more to report. Cheers! If you are very interested in growing sweet potatoes in the north, try this book, it’s great: “Sweet Potatoes for the Home Garden” by Ken Allan, Publisher: Green Spade Books, Price $20. The author grows sweet potatoes in Ontario, Canada. You will probably need to Google to find him and the book. As I recall, I ordered a copy of the book directly from the Author. He was a real pleasure to do business with, and answered several questions by E-mail. Thanks for the tips on growing sweet potatoes. I know all the blog viewers who have the space will enjoy the challenge. I only have room to grow the vine as an ornamental from a single potato, but I’m sure the ones that come up with the potatoes from your tubers are awesome! I actually made a sweet potato soup last Thanksgiving that was a big hit, so I’m sure you’ll prepare some nice recipes from your harvest. Cheers! Hey there! I bought some “oriental” sweet potatoes at the grocery store a few weeks ago here in Brooklyn, NY. I would have bought the usual orange kind, but I decided to try these potatoes because they were vivid purple, with vivid purple leaves coming out here and there. I saved one to plant and made fries out of the rest. My family loved them, but I thought that this kind of potato was too tough and dry (I could barely slice into them with my best steak knife). I was also surprised because the inside of the potato was bright white, while I expected it to be purple. Did the purple leaves on your potato stay purple, or turn green? if mine turn green, I’ll be very disappointed. Thanks for the tip… I’ve never tried pineapple before. Will have to give it a shot! Did you know that you can eat potato vine leaves and the small stems in salads and stirfrys?